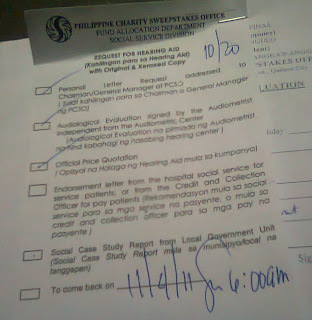 How to Apply For A Hearing Aid at PCSO, PART 2 | To Be, To Be. Tutubi. If you may recall, my sister and I had this plan to apply for a hearing aid for my mom from the PCSO. 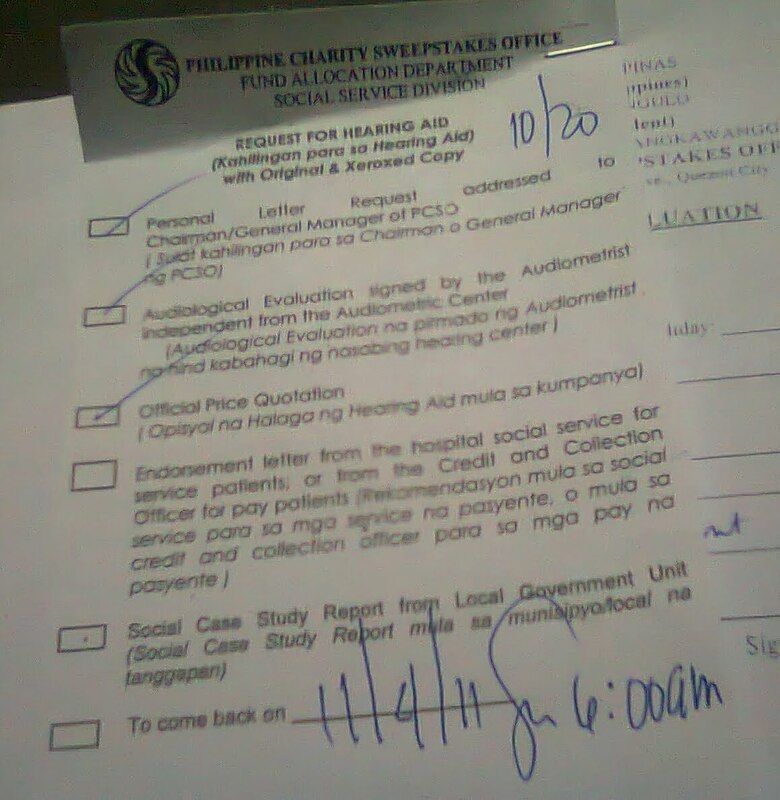 In September, my sister went to PCSO with the initial requirements for a hearing aid. And then she was given a referral slip to a doctor at UST. When we called for an appointment, we were told to present 3 audiological reports and 3 quotations from PCSO-accredited hearing aid centers. When we have completed those requirements, my mom and my sister went to UST and my mom went through another audiological test to confirm the findings of the three other centers. Then my sister was given a recommendation letter which she brought back to PCSO last week. She was there at 7am and was finally able to get an appointment for an interview on November 4. The interview was for my sister only and my mom need go with her. I don't know yet what will be asked during the interview but I am hoping that the PCSO will grant our request. Initially, the hearing aid centers sealed their price quotation and it was only opened at the UST clinic during the medical evaluation and a recommendation made based on those quotations. The prices quoted to PCSO was way below the price quoted to me when I asked the price of those same hearing aids. I also found out that the PCSO will only grant up to P10,000 but that is still going to be a big help on our case.I will just pay the additional money on the price they quoted the PCSO when it is not enough to pay for hearing aids on both ear. I hope that we will finally get some good news when my sister goes to the interview. ask ko lng po kung kumuha p kyo social csse study?ppano at san po nkkuha nun? Hindi na kami kumuha ng social case study kasi hindi naman hiningi. Pero ang alam ko, kumuha na kami nun dati. Ask mo lang sa Barangay nyo kung saan puede kumuha. hi ask ko lang kung anong mga hearing aid centers 'yong tinuro sa inyo ng UST? Hi ask ko lang kung anong mga hearing aid center yong tinuro sa inyo ng UST?